Japanese Yubari melons have long been a popular delicacy in Japan, they're basically Rockmelons (or known as Cantaloupe in the US), but Yubari melons are a very high-end type and far superior in quality and taste to a typical rockmelon, hence they are very expensive. In Japan, because of their superior quality in product & expensive price tags, Yubari melons are often given as expensive souvenirs. Just one Yubari melon typically costs around JP￥6,000 to JP￥15,000; this is the equivalent of around US$77 to US$192 each! Sometimes a Yubari melon can fetch to even higher prices, in 2008, 2 Yubari melons fetched up to JP￥2.5 million together at a auction in Japan! I did some research and learnt that these Yubari melons are named after its cultivator Yubari King located in a town called 'Yubari' in the northern japanese island of Hokkaido. 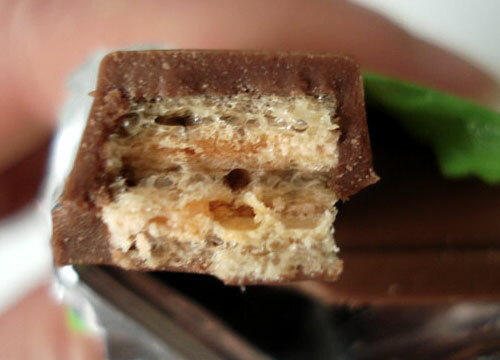 from appearance these Yubari melon KKs look just like any other KK; different flavoured chocolate in between wafers and coated with more chocolate. But unlike most Japanese KKs produced by Nestlé Japan, these Yubari melon KKs were coated with milk chocolate...this is quite a significant rarity because Nestlé Japan usually coat their KKs with white choc, unlike in western countries where they mainly use milk choc. I remember Nestlé Japan also released another version of Yubari melon KK a year before, but that version also had orange-coloured Yubari melon chocolate coating the outside of the wafers too, and the coating was made of white choc instead, which is how the choc is able to turn orange when the Yubari melon extracts were infused into the choc. Unlike this newer version that is coated with milk choc...but now having tasted both versions, I think the melon flavour complements milk choc better than white choc. 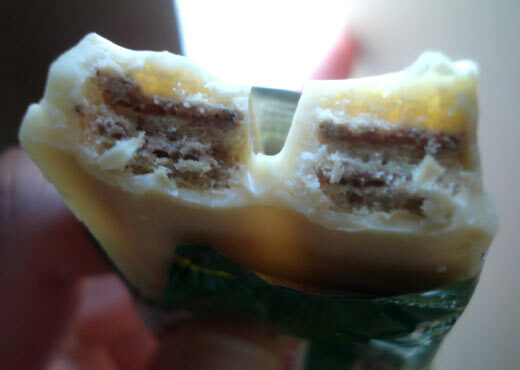 With white choc, the melon flavour tend to become too concentrated and overpowering, depending on how much melon flavour is infused into the choc. But milk choc helps to balance out the melon flavour better, therefore I think this most recent Yubari melon KK is better than the older version. Overall I'm very satisfied with this Yubari melon KK, the pleasant melon flavour was substantial enough without being too overpowering, and the flavours & sweetness of the melon and milk choc were well-balanced, and the wafers were nice and crispy as usual. Has this become 1 of my favourite all-time KK flavours? Absolutely! However I have to admit that I do have a small doubt about whether Nestlé Japan had actually used REAL Yubari melon content to make these Yubari melon KKs...because as you all know, Yubari melons are VERY expensive, so that makes me wonder whether the company had enough money to buy all the Yubari melons to make these KKs...or had they actually opted for the much cheaper options of either using regular rockmelons, melon extracts, or the much worse artificial colouring & flavours? 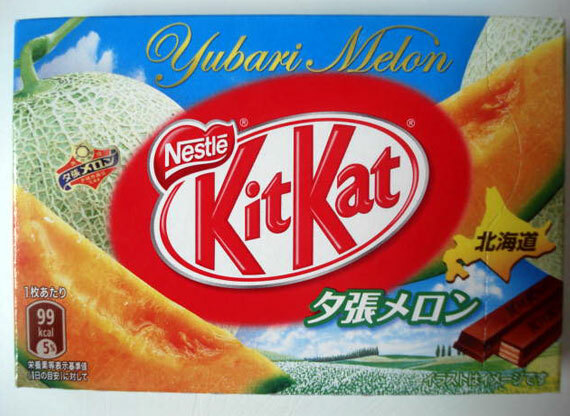 My doubts are mainly due to the fact that Yubari melons are insanely expensive...but on the other hand, Nestlé Japan only make these Yubari melon KKs as special regional releases for a very limited time...so perhaps they could afford to make barely enough for the very limited release periods? Although I think it's more likely they used some kind of cheaper melon extract or essence. 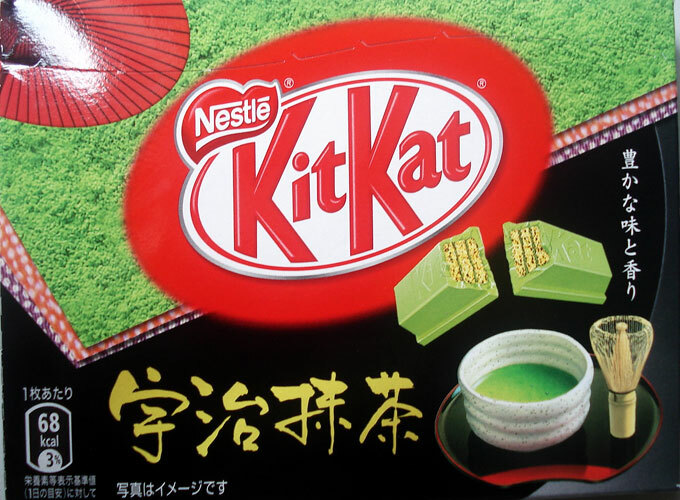 here's another pack of japanese Kit Kat goodie I ordered from NapaJapan a while ago; in Sakura maccha (aka matcha) latte flavor! each box contained 6 mini KK bars, they were only about half the size of a regular-sized KK bar. I like the pastel green color of the maccha/matcha flavored white chocolate coating surrounding the crispy wafers. There was a decent amount of maccha flavor infused into the white chocolate coating, and because sakura has a very weak flavor to the point of being almost tasteless, as I expected, the flavor of sakura was nonexistent in the chocolate coating, at least I wasn't able to taste any. 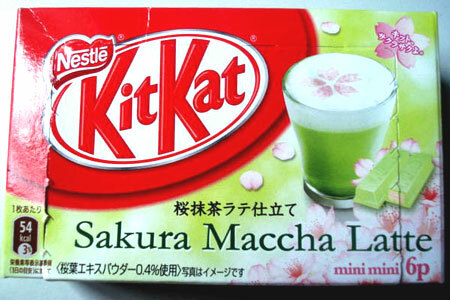 But does the overall flavor of the choc coating taste like sakura maccha latte? I honestly wouldn't know because I've never tasted maccha latte before, let alone one that has sakura added in, but I imagine it would probably taste basically like milk & maccha (with sakura flavor being virtually nonexistent). And basically with this KK you have the maccha flavor from the maccha powder infused into the choc, and I suppose the milk component would come from the white chocolate coating itself (as white choc is made with milk solids). So in this sense, I guess the overall flavor does resemble maccha latte to some extent. Overall this was a nice flavor KK, but certainly not one of the best I've tried nor is it one of my fave KK flavors. I really liked the choc coating though, it was substantially thick and rich with a decent amount of maccha flavor, and the crispy wafers never disappoint. But being someone who loves anything made with maccha, I would've preferred more maccha infused into the white choc coating, because the amount of maccha flavor was still a bit too weak for my preference. I ordered this Japanese Kit Kat in 'Edamame Zunda' flavor from NapaJapan, before I get into the review, here's a little info about Edamame Zunda. Zunda is a type of Wagashi (traditional Japanese sweets often served with tea) and is basically a sort of Mochi, edamame Zunda is mochi covered in a sweetened paste made from edamame (immature soybeans in pod), hence it has that beautiful light green colour. Edamame Zunda can often be called as simply 'Zunda mochi', the Zunda has its origins stemmed from Sendai prefecture (the worst affected area of the march 2011 Tohoku earthquake & tsunami disaster). the chocolate coating was white choc flavored with, well, edamame Zunda of course, the choc coating was thick and smooth with a lot of sweetness, I could actually taste a weak hint of lite flavor of the mochi in the choc coating. However, I couldn't taste any soybeans flavor, perhaps it was obscured by the overpowering sweetness of the chocolate coating and the edamame paste is suppose to be sweetened also after all. But I love the light pastel green colour of the white choc coating, there were more subtle edamame zunda flavored white choc between the classic crispy wafers. This was a nice flavor no doubt different, the choc coating was enriched with a lot of sweetness, but the overall taste certainly was different to a simple white choc KK, I can't quite put my finger on it, but there was a certain lite refreshing taste to the pastel green zunda choc, it did somewhat taste like the makers at Nestlé Japan had blended white chocolate with mochi, however I couldn't taste any degree of soybeans flavor or the flavor of the pods. With my lack of prior tasting experience with edamame Zunda, has proved to be a disadvantage for me in this taste judging. I'm not even sure if any degree of soybeans flavor is even retained in the finish product of edamame Zunda, so I really cannot tell whether the lack of soybeans flavor & its pods in the white chocolate coating was a flaw in the execution of this particular KK flavor, or there is simply no soybeans flavor in the edamame zunda finished product. Therefore, with this review I can only go by what I CAN taste and how I feel about it, overall, this was a nice flavor, it had a pleasant lite and refreshing taste. Though I am a little disappointed that the flavor of the immature soybeans was non-existent, I would've loved it to have at least a hint of soybeans flavor to help cut back on the sweetness just a little bit, it's certainly not one of the best flavored KKs I've tasted, but nonetheless, I still savored every bite. 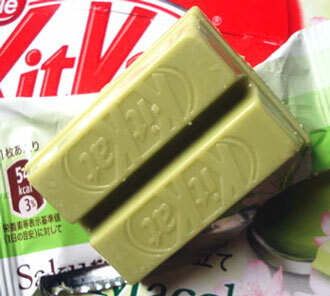 It has been a while since I last blogged about Kit Kats, so today I will review 2 more Japanese KKs, both fairly recent releases; the renewed version of the popular Matcha flavor, and the new Strawberry Tarte flavor, both released in late 2011.
the thick sweet green matcha chocolate coating the classic crispy wafers, the matcha flavor infused into the white choc coating was so strong and enriching, the sweetness of the white chocolate and the bitterness from the matcha powder used were beautifully balanced in flavor, the amount of matcha powder also gave the choc coating its brilliant green color naturally. 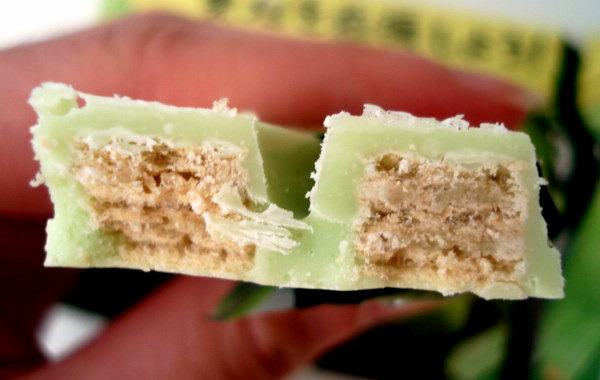 There were also layers of more green matcha flavored choc between the wafers, further enhancing the overall richness of the matcha flavor in each bar. 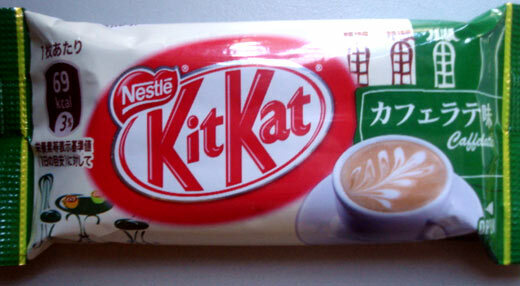 Overall, I can safety say that this is no doubt the best version of this classic favorite flavor of KK from Nestle Japan. 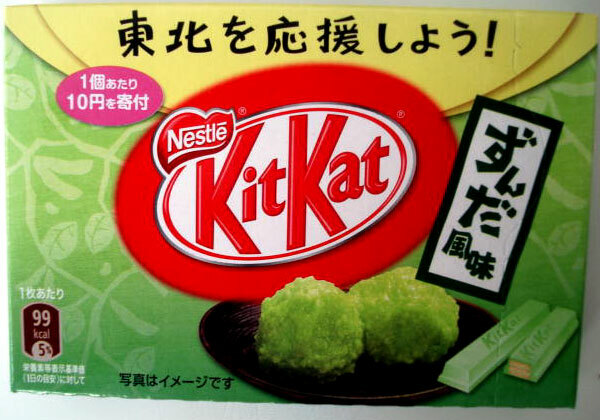 It well exceeds its previous matcha versions, which I thought had weaker levels of matcha flavor. I will certainly be getting more of these! this box contained 6 pieces of mini strawberry tarte flavored KK bars. 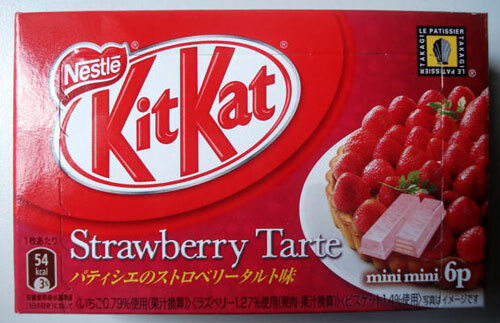 The Japanese sure love their strawberry and strawberry desserts flavored sweets, and Nestle Japan has released heaps of strawberry and strawberry dessert flavored KKs over the years. 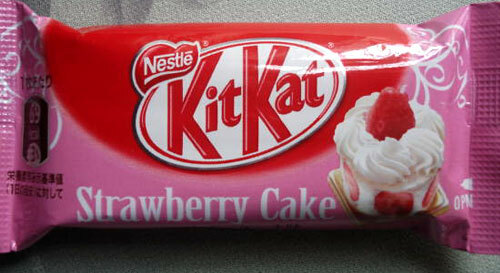 Their latest strawberry flavor edition promises to reminiscent the popular strawberry tarte dessert. I have to admit, when I first discovered this new flavor, my first thought was "here we go again..." due to the array of different strawberry KKs we already have on the market over the years (which by the way, they all ended up tasting more or less the same). Not that I hate all this overuse of strawberry flavor in sweets, but I have to admit that lately I have become rather annoyed with Nestle Japan for constantly pushing out all these strawberry flavored KKs which are labelled as different flavors, but most (if not all) end up tasting pretty much the same and not much else. And as soon as I took my first bite of one of the strawberry tarte KK bars in the box, my suspicions were finalized...the flavor was just as I suspected; artificial strawberry flavoring, as usual, just like many other strawberry flavored confectioneries in the world nowadays. 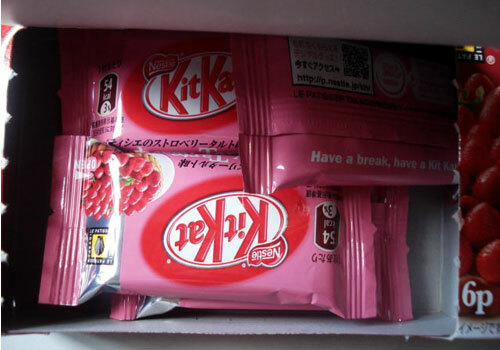 Besides the artificial strawberry flavor, I honestly could not detect any other flavor in these KK bars, no tartness either...just perhaps they used a bit more artificial flavoring this time, which enriched the artificial strawberry flavor a bit too much. Overall, I think this new strawberry tarte KK is just another excuse from Nestle Japan to use even more of the artificial strawberry flavoring, the taste was very much the same to most (if not all) of the other strawberry flavored KKs I have tried over the years, only marketed in yet another different packaging. 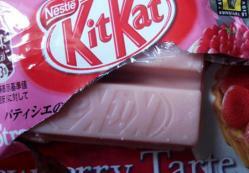 It's been a long while since I last blogged about a Kit Kat snack, so I thought today I should review one. This new KK flavor I'm going to blog about today is a special release, nothing special about the KK flavor itself, but rather the marketing of the product. Nestle Japan recently collaborated with MOS Burger to create this special white chocolate KK flavor. Now, before I get into this KK itself, here's just some background info on MOS Burger, in case some readers have never heard of it. MOS Burger is a Japanese fast food chain that was first established in 1972, the 'MOS' in its name stands for "Mountain Ocean Sun". MOS Burger is famous and currently also has stores in Taiwan, Singapore, Hong Kong, Thailand, Indonesia, and just recently a MOS Burger store opened in Brisbane; Australia in April 2011! There used to be one in Hawaii but it closed own in 2005. It seems a store has also recently been opened in S.Korea in late 2011. According to wikipedia, there were 1327 MOS Burger stores in total in 2005, but the number of stores has increased since then. MOS Burger is currently the second largest fast food franchise in Japan, after McDonald's. 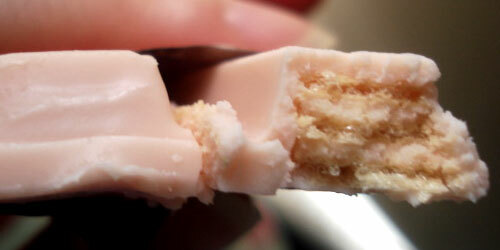 creamy thick white chocolate coating the classic crispy wafers, with milk chocolate sandwiched between the wafers. 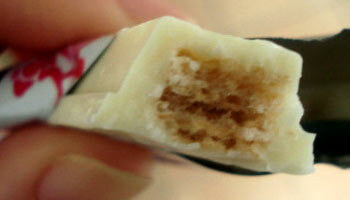 The blend of both white and milk choc really complemented each other and balanced each other out evenly. Even with little amount, the milk choc filling was still quite strong but not overpowering the white, in turn, the white choc coating wasn't particularly dominating either. A very good blend indeed. Overall this was a very good white KK flavor...though I think it probably would've worked even better if they had coupled the white choc with dark choc instead. For me, this is the best white choc KK flavor that Nestle Japan has come up with so far, in fact, I think this is the best white KK bar ever released! I mentioned earlier that the marketing for this KK is quite unique, because this is a collaborative KK between Nestle Japan and MOS Burger, this special white choc flavor KK is only exclusive at selected MOS Burger restaurants across Japan, so it's quite a rare release, and I assume, only for a limited time. But luckily NapaJapan had these in stock and that's where I ordered mine from this is one of the reasons why I love shopping at NapaJapan, not only do they have so much in their catalog, they also always manage to get their hands on even the rare of products! As far as I know, this is also the very first time Nestle Japan has partnered up with a fast food franchise to create a special release KK. I will review about 2 Japanese Kit Kat flavors today. thick rich milk chocolate coating with sweet caramel chocolate cream sandwiched between the classic wafers. The caramel choc cream contained the right amount of sweetness but the caramel flavor itself was a bit too subtle for me, while the milk chocolate coating was almost over-powering. I would've liked more of the caramel sweetness infused into the choc cream filling. 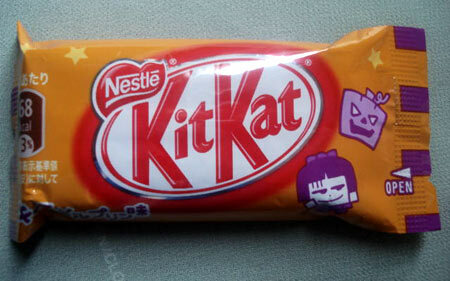 After all, the star flavor of this should be the caramel flavor, not the milk choc coating. sweet strawberry flavored white chocolate coating with more strawberry cream between the wafers, I could also taste the subtle essence of vanilla in the chocolate, slightly reducing the substantial strawberry flavor. Overall it's nice and the coupling of strawberry and vanilla is one match made in heaven. However, in terms of taste, it bears very little difference to many other strawberry type flavors the company has released over the years. even though this is recycled marketing with very little alterations wrapped in a new packaging, I still gave this flavor 4 out of 5 stars, because at the end of the day, the flavor and taste is the most important thing to me. Personally, I'm also not a fussy eater nor am I picky, and I sure enjoyed savoring this particular KK nonetheless. Some other foodies out there may not be as positive as I am about this one. I will definitely be getting more of this in the future! 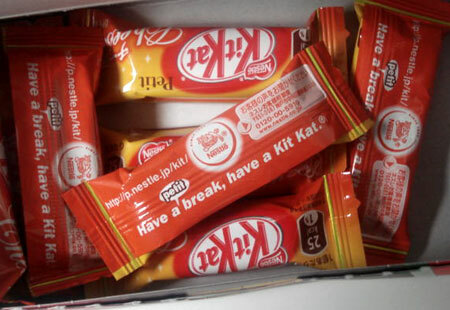 Having came across quite an amount of unusual and wacky flavors of confectionery and sweets from Japan, I guess I shouldn't be all that surprised when I saw this box of CHEESE flavored Kit Kats at NapaJapan, and yes, these are from Japan also! 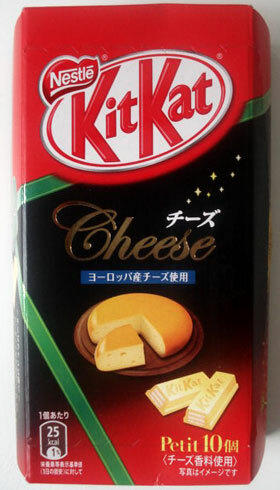 As much as I love Japanese kit kats, I have to admit, I was a bit apprehensive to try this particular flavor at first...cheese-infused choc KK didn't really sound all that appetizing for me initially. But then I thought, considering I've tried and endured some really strange flavored sweets in the past, why not give this one the benefit of the doubt also? 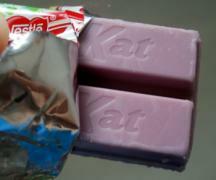 After all, this is Kit Kat, and I love KKs! So after a while of much thought, I decided to give this one a try at least. Firstly, when they dubbed these as 'petit', they literally meant it, these bars of KK are the smallest size KK bars I've ever seen, they're only about 3/4 the size of a mini KK bar in length, and the width of each piece is merely a single-bar, different to the typical double-bar. Secondly, the taste itself...well, one thing is for sure is that they really didn't hold back with the cheese flavor! 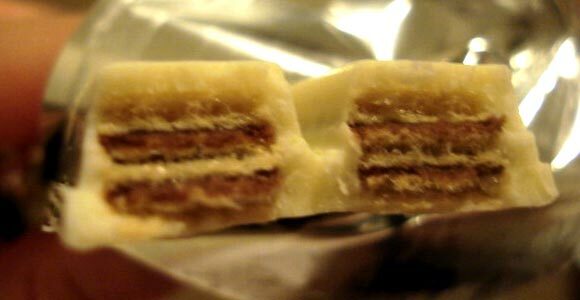 The amount of the cheese flavor in the chocolate coating was so strong it dominated over the sweetness of the white choc. What you get are tiny bars of 'cheesy' chocolate, you could barely taste the very vague sweetness of the choc, it was almost non-existent, the cheese flavor was THAT strong! Was the whole flavor experience pleasant? Well, I'm sort of sitting on the fence with this one. I'm all for unusual and wacky flavors and I see myself as someone who is rather more open and receptive of strange and unique flavors than some other stricter foodies and food critics might be. But do I "truly" enjoy my chocolates to be infused with a non-sweet ingredient that's so strong and so over-powering in flavor that it almost takes away all of the sweet goodness, something like cheese? Perhaps not. I prefer having cheese as a separate indulgent to accompany some chocolate, but not so much as to infuse the two components together for a confection. 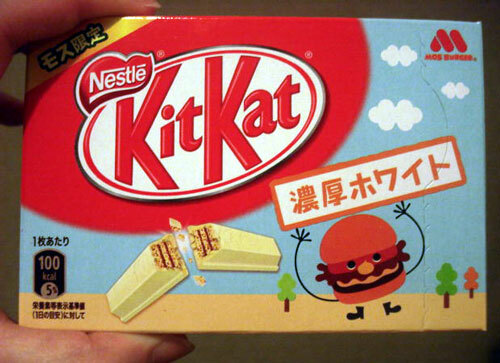 Perhaps the guys at Nestle Japan thought that it might be an interesting idea...but does it really work? Probably not. But still, I don't regret trying this cheese KK. I might not want to get my hands on it again anytime soon, but I'm glad I at least gave it a try. But despite the flavor not being particularly pleasant, I still thought it was somewhat an interesting concept...after all, it did got me somewhat intrigued. Ok, before I go into reviewing this particular KK, let me just explain what Annin dofu is, in case anyone here don't know what it is. Inspired from a popular Chinese dessert called 'Annin dofu' in Japanese romaji, the dessert is called 'Xingren dofu' in Chinese and literally translates to 'Almond tofu', but often it is also called 'almond jelly' or 'almond pudding'. This dessert is thought to originate in Hong Kong and is often served in dim sum restaurants worldwide, it's also a very popular dessert in Japan, Singapore and Taiwan. Even though the dessert has 'tofu' in its name, there's actually no tofu content in the dessert at all. The main ingredient in Annin dofu is of course almonds, authentic Chinese would use Chinese type almonds, but regular almonds can be used too. The process of making Annin dofu includes soaking and grounding the almonds in water, then extracting the almond milk, sweeten, heated up with agar and then chilled. Once the dessert is chilled, it solidifies into the texture, consistency and appearance of a gelatin dessert or soft tofu; hence the use of 'tofu' in its name. However, considering the actual ingredients used to make the dessert, and its characteristics, 'Almond pudding' or 'almond jelly' would be the more accurate names to best describe the dessert. I had only ever tasted Annin dofu once, and it was at a Hong Kong restaurant in Tokyo when I went to Japan last year, and I have to say, I was very pleasantly surprised by how delectable it was, the dessert was so light, refreshing and sweet and was very cleansing to your palate. So when I saw this special Annin dofu KK at NapaJapan, I was quick to add it to my shopping cart! And I'm glad I did! The Annin dofu flavor in the white chocolate coating was just enough to shine through and cleanse your palate, it wasn't too subtle, nor was it too over-powering, you can still taste the sweet white choc too. And the wafers, well, they were lovely and crispy as usual, with more choc between the wafers. Overall, do I recommend this Annin dofu KK? Definitely! I'm sort of disappointed that I had only ordered one mini KK bar of this, if I had known it was going to be this good, I would've ordered more! The reason why I didn't order more at the time was because of the price, considering this is yet another special flavor, and take into account the numerous other special regional flavor KKs I've reviewed in the past, you can imagine how expensive this one is compared to regular flavored mini KK bars. Besides, I had ordered several other special regional KK flavors, among a stack of other goodies in the same order. But I definitely recommend this Annin dofu KK to anyone, at least give it a try, I'm sure to order more of this in the future, I think it's worth it. Sorry that I haven't been updating this blog for almost a month, I've been very busy and went on a bit of a hiatus. I suppose I should have posted a notice to you guys before I left, ne? Once again, sorry for not letting you guys know that I had to take some time away from updating. Anyway, I'm back now so hopefully I can update more regularly from now on. 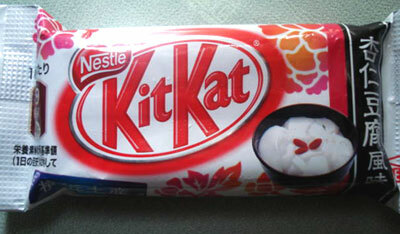 And what better way to revive this blog than going back to one of my all-time favorite sweets; Kit Kat! 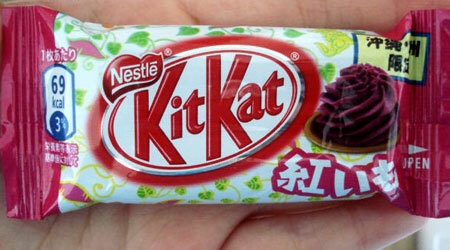 And yes, it's another review on a Japanese KK flavor (most of my KK reviews are of Japanese KK anyway). Roasted purple sweet potato is a popular light snack in Japan, and any purple sweet potato confectionery is always a sure hit, and it certainly is the case with this purple sweet potato KK! lovely smooth chocolate coating infused with just the right and accurate amount of purple sweet potato flavor, with more purple sweet potato choc between the crispy wafers. Divine! 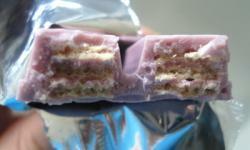 And as you can see, the choc coating also had a pretty soft shade of pastel purple colour to it. I absolutely love this KK, it's one of my all-time fave KK flavors! It's another special regional flavor from Okinawa Prefecture, it's also one of the most popular KK flavors in Japan, and once you've tried it, it's not hard to understand why. I ordered this mini bar @ NapaJapan, it was pricey though, about US$2.50 for 1 mini bar of this. But special regional flavors are typically more expensive because of their specialty, and often, limited availability.